Hopefully, you have been preparing for some time and have an adequate supply of rations. Maybe you’re new to the game and are not as prepared as you hope to be. Regardless, fresh sources of protein will be a needed necessity, and you know how to prepare for a hunt. While larger game such as deer provides lots of meat in short order, there might be times where you just need to supplement your food source. Successful deer hunts are also not guaranteed, and hunting larger game can take a lot of energy. So, where do you turn to when you are either in need of food quickly, or just want an easy, fresh source of protein for the table? We’re not inventing the wheel here. Squirrel has been part of the American cuisine long before it was founded. Regardless, the common gray squirrel is criminally neglected when preppers and survivalists plan for emergency food sources, and we want to outline the gear needed and some hunting strategies for bagging squirrels when your life and the lives of the family depend on it. One of the reasons squirrels are a good target for fresh protein is the availability and affordability of ammunition that can kill it. Yes, we went through a tough period in regards to .22lr ammunition during the last few years, but we seem to be over the hump. 22lr is relatively cheap, and you should have no problem stocking up on it before it is needed. There is a variety of .22lr ammunition that you can buy ranging from bulk soft lead bullets to higher-powered polymer tip cartridges. Regarding firearms, any .22 chambered for .22lr will kill a squirrel. Take a look at this article that outlines several of the best .22lr rifles available. While taking a squirrel with the iron sights is more than possible, you might also want to invest in a quality rimfire .22 scope for added distance and accuracy to your shooting capabilities. Shotguns are just as popular for squirrel hunting as rimfire rifles, but regarding survival, we feel that they have a few drawbacks that rimfires don't have. Your range and accuracy are restricted with a shotgun. Also, in a protein crisis, you want to conserve as much meat as possible, and with a .22 outfitted with a sturdy scope, you can maximize the amount of meat available. The positives of shotshells over rimfire ammunition are that you can reload shotshells with the proper materials and tools while rimfire rounds are useless after their initial use. With that said, we still highly recommend a reliable 12 gauge for any serious prepper, but for squirrels, we feel a .22lr chambered rimfire is optimal. Do you have to be decked out in head to toe in camo to kill squirrels? We don't think so. In fact, just having some natural colors will be more than enough. Don't stroll out in neon colors and you will be fine. There are some trapping techniques you can use for small game, including squirrel, but I am a firm believer in active hunts producing much bigger harvests and should always be used over trapping in survival situations when you have the gear. Setting up some traps as backups or supplemental sources is great, but get out there with a rifle if you want your best chance at bagging game. 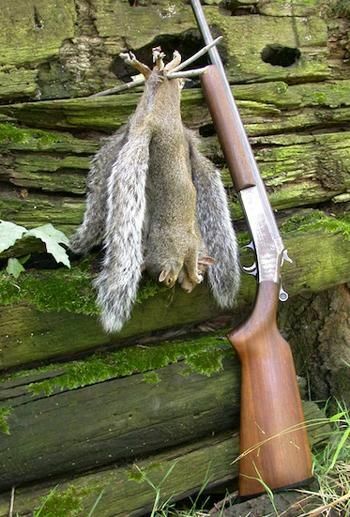 With squirrels, you don't have to have special gear, all you need is your rifle, ammo, and some woodsmanship. Let’s get out front and state the obvious, squirrel hunting is going to be much easier during late fall and winter when the leaves have fallen. When the foliage is heavy take some extra time to sit listen and watch. Your best bet for taking a few squirrels is to get into the woods early. If you can, set up before daybreak in an area where you have seen squirrels or at least seen signs such as remnants of feeding or nests. Look for large hardwood trees and sources of acorns, beechnuts, and hickory nuts. Use a tree limb or shooting stick to steady yourself for the first shot. This is your best and easiest chance of taking at least one squirrel. Be aware of an area where other squirrels are holding so you can quickly maneuver for a second shot after you drop the first squirrel. The squirrels in the immediate area are going to hole pretty quickly once the shooting begins. Hopefully, you will have bagged a couple and are now ready to move to the next area. Give this section an hour or two to settle down and in the meantime, do a little stalking. When stalking squirrels, it's important to keep your mind on the hunt and not let yourself wander. Be aware of where you are stepping and glide through the woods as quietly as possible. Stomping around is just going to send the squirrels to their holes and be a waste of time and energy for you. Remember what your hunting for, survival. Walk ten to fifteen yards and then stop to listen and scan the trees for movement. Listen for scampering, chattering, or even squirrel barks. The latter is usually a bad sign and means the squirrels are alerted to your presence. When you come up in a squirrel relax and take your time before firing. Find a prop to steady your aim and make a clean shot. There are not going to be boxes of ammunition available at the store to replenish your stock so make every shot count. You can walk and repeat as often as needed and eventually return to the area you know squirrels were at earlier. Be sure while stalking that you are also scouting for signs of squirrels in new areas where you can hit in future mornings. By mid afternoon you hopefully have a couple pounds of fresh meat. 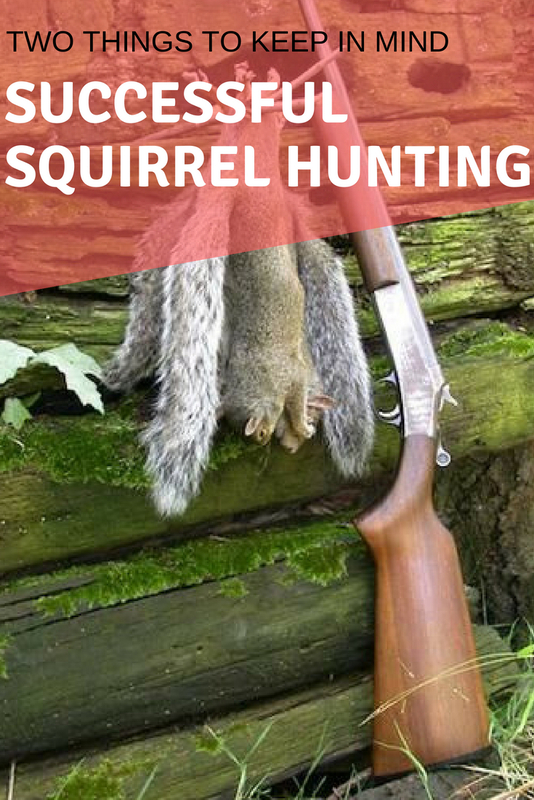 For some extra squirrel hunting tips check out this article. This article doesn't cover anything new or groundbreaking regarding survival. I hope that it highlights an obtainable source of food that is readily available in most American’s backyards and only takes a little preparation and exercises in woodsmanship and marksmanship. When times get tough, and the rations start to run low, there is a source of fresh meat right outside your door ready to be put on the table. Speaking of having meat on the table, be on the lookout for our next article outlining how to prepare your fresh squirrel for cooking or preservation. Huston has been hunting and fishing in the southeastern United States for the better part of 19 years. He has a B.S in Microbiology and is passionate about outdoor and scientific endeavors. He is the founder of Discovery & Learning Writing Service where he assists websites and companies generate trustworthy and high-quality content for the benefit of their readers and clientele.